When have you performed brilliantly? When have you followed certain disciplines and delivered on the day? You may have been making a presentation, singing at a concert, playing a sport or solving a particular problem. What did you do right then? How can you follow these principles – plus maybe add other skills – in the future? Looking ahead, how can you rise to the occasion and achieve your goals? There are many ways to perform fine work. One approach is to start from the destination, work backwards and make a specific plan for achieving the goals. It is then to follow the daily disciplines required to pursue the road map and deliver peak performance. “We start by defining the standard of performance we must deliver on the day. Every player needs to know their job and the goals they have to achieve. Good coaches invite people to set goals by describing in behavioural terms what they can do to perform at their best. They may use the following framework. Imagine that you want to do fine work at a particular event. You may aim to take part in a sport, give a keynote speech, pass an exam or whatever. If you wish, try tackling the exercise on this theme. This invites you to do the following things. Describe the specific situation where you want to do your best to deliver on the day. 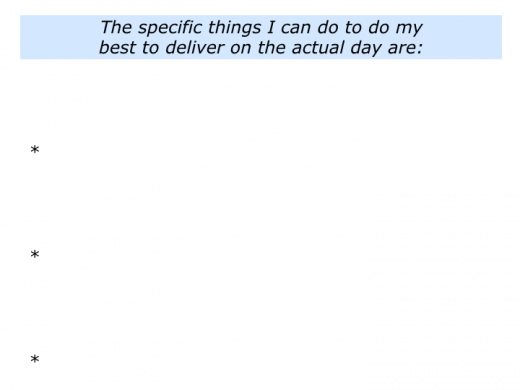 Describe the specific things you can do – in behavioural terms – to perform at your best on the day. Let’s return to the time when you performed brilliantly. It may have been that you pursued some of the disciplines followed by peak performers. Such people often do the following things. They clarify their specific goals. They clarify the strategies they can follow to give themselves the greatest chance of achieving these specific goals. They make an action plan – such as a road map – they can follow to work towards achieving these specific goals. They follow the daily disciplines required to achieve the level of performance required to achieve the specific goals. They keep following the disciplines – plus maybe add other things – to do their best on the day and achieve the specific goals. Great workers continually do the basics and then add the brilliance. This differentiates them from people who show brilliance on the odd occasions, but often fail to deliver the basics. Talented young people may burn brightly, for example, and be hailed as the next stars. Talent is a good starting point. People need to develop certain routines, however, to consistently deliver great performances. Soccer players who have good records of scoring penalties, for example, continually practice their routines for taking penalties. They know exactly how to prepare properly mentally, breathe deeply, where to place their non-kicking foot and how to take the shot. Players who have poor records of taking penalties do not follow such disciplines. This was highlighted in a study of young soccer players who were each asked to take five penalties. Each player took each of their allotted five penalties differently and had a poor scoring rate. They used their energies to think of more spectacular ways of scoring, rather than simply putting the ball into the net. They kept making things up on the spot. Imagine that you want to do fine work at a particular event. If you wish, try tackling the exercise on this theme. This invites you to do the following things. Describe the specific disciplines you can follow and develop to increase the chances of delivering the required performance on the day. Positive people see challenges as opportunities, rather than as obstacles. Some people with illnesses, for example, see these as a chance to raise money for charity and educate others about ways to treat the illness. Great workers take a similar approach to delivering on the day. Different people use different methods for doing their best. Some people, however, pursue the following principles. They start by seeing in things in perspective and seeing the big picture – they count their blessings and appreciate what they have in life. They return to the present and remind themselves of the strategies they want to follow to do their best on the day. They again rehearse following these disciplines – making sure they will keep doing the right things in the right way – to deliver the required level of performance. They re-centre, breathe, click into action and then go on stage. They have a positive attitude, follow the principles and give everything they can to do their best on the day. If you wish, try tackling the exercise on this theme. 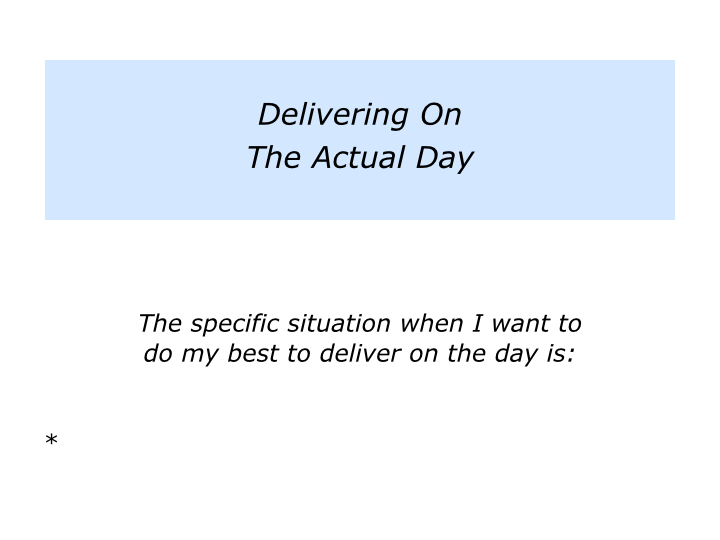 This invites you to focus on how you can deliver on the day. You will, of course, do this in your own way.